Is the Sony Bloggie Sport the hardiest mini-camcorder yet? The Sony Bloggie Sport isn't the only ruggedised pocket camcorder around: Panasonic offers the pricier, pistol-gripped HX-WA20 and HX-WA2 models, and there's also the cheaper Kodak PlaySport Zx5 and Samsung recently launched the eminently affordable W200. The Sport is chunkier than previous Bloggies such as the Sony Bloggie 3D and the Sony Bloggie Touch, due to its armoured, sealed shell. This stops dust and water (to a depth of five metres) from seeping into the innards, and protects against drops onto a hard surface. The Bloggie Sport features a similarly stripped-down control set to previous Bloggies, with just three physical buttons: power, video start/stop and a shutter button for stills. Everything else (the digital zoom, the LED lamp and the settings menu) is handled by the resistive touchscreen, and this is a pain at times, especially if you're used to capacitive touch tech – often a few prods are necessary to change a setting. The simple controls make using the Sport equally simple. There's really no need to fuss too much here: just point it at what you want to shoot, press the button and let it do the rest – it'll even reorient footage depending on how you're holding the camera. The only time intervention is required is if you want to switch on the LED for gloomy conditions, or flick the camera to underwater mode. Touch detection aside, the 16:9 screen is reasonably bright and clear – but not exceptionally so like the displays on most of Sony's digital cameras. At 2.7 inches it's a little smaller than we're used to, and the 230,000-odd pixels don't deliver a huge amount of detail when reviewing your footage. Sony makes no claims regarding the longevity of the lithium-ion battery, but during a few hours of use it lost only a single bar (from four) on the indicator – possibly because it charges via USB every time you plug it into your computer. Videos can be shot in a variety of formats, with 1080p at 30fps and 720p at 60fps being the best. Quality is on a par with what we've seen in previous HD Bloggies, so don't expect a Hollywood-esque sheen – but detail is rich and colours are punchy. Stills aren't so hot, with a severe lack of contrast detracting from their impact. The 4GB of built-in storage is enough for two hours of 720p HD footage. The footage is broadly similar to what you'd get from a high end smartphone, so bear that in mind before buying. Obviously, most smartphones won't survive an encounter with a swimming pool. 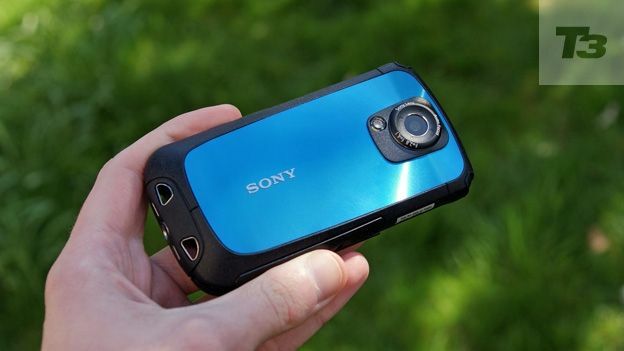 The Sony Bloggie Sport is much like previous Sony pocket camcorders – only a lot hardier. Waterproof and impervious to dust and (moderate) drops onto hard surfaces, you'll struggle to break it. It's simple to use, with barely any settings to tweak and one huge “record” button to kick off video – although the touchscreen can be slightly unresponsive at times. The quality of the HD footage isn't up to the standards of a DSLR, compact system camera or even a “normal” camcorder, but if you're not expecting Avatar-quality results you won't be disappointed – this is as good as one can expect from a pocket-sized camcorder, and having that in something that is almost impossible to damage will appeal to any outdoors or sports-loving person. Although at nearly £180, it's no cheap.